Beyond its still image performance, the a7S is also quite adept in regard to recording video. It is able to output uncompressed 4:2:2 UHD 4K video to an optional external recorder over HDMI, as well as record full HD 1080p video in the high-quality XAVC S format at 50 Mbps in multiple frame rates. Extending the video recording capabilities is support for S-Log2 gamma, which helps to expand the effective dynamic range during recording, as well as picture profile options, time code, and zebra marker display aids. Sound can be recorded in the AAC/Linear PCM format via the internal stereo microphone, with a built-in headphone jack for on-board monitoring, or via an external microphone. Rounding out the a7S’s imaging capabilities, both a 3.0″ 921.6k-dot tilting LCD monitor and 2.36 million-dot OLED electronic viewfinder are available for image monitoring and review. Built-in Wi-Fi connectivity, with support for NFC, is available, too, for instant sharing of imagery from the camera as well as remote camera control from a linked mobile device. 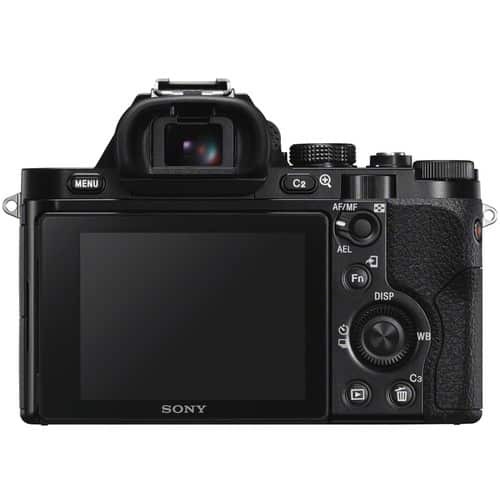 Incorporated within the sleek body design is a 12.2MP full-frame Exmor CMOS sensor and BIONZ X image processor, which work together to enable an expansive dynamic range with minimal noise and notable sensitivity. The a7S features a native sensitivity range from ISO 100-102400, which is further expandable to ISO 50-409600. Coupled with the large individual pixel size the 12.2MP sensor affords, this camera is well-suited to use in low-light conditions.The sensor’s design also features a new-generation RGB color filter array, as well as a gapless on-chip lens design. Together, these two technologies enable truly efficient light-gathering abilities that further reinforce the low noise, high-sensitivity design. Furthermore, an anti-reflective coating has also been applied to the seal glass of the image sensor to minimize surface reflections, glare, and ghosting for contrast-rich, color-neutral imagery.The sensor and processor combination also avail a wealth of performance-related benefits to still shooting, including a Speed Priority continuous shooting rate of 5 fps, or a 2.5 fps shooting rate with continuous AF. The contrast-detection AF system employs 25 distinct points to quickly and precisely acquire focus in light levels as low as -4 EV to support working in a wide variety of shooting conditions. In addition to the standard 24p/30p/60i recording formats the a7S is also able to record at much higher frame rates for slow motion playback, albeit at lower resolutions. 1080p video can be recorded in up to 60p using the entire sensor. And 120 fps is possible at 720p using an approximately APS-C sized center crop of the sensor. 120 fps recording allows for about 5x slow motion when played back in 24p. To make sure the a7S is able to use its extensive dynamic range while recording video it incorporates extensive customizable color and gamma controls. Users can adjust the gamma, black level, knee, color level, and more. Also users can use the same S-Log2 Gamma Curve that is found on high end Sony Cinema cameras that squeezes up to 1300% more dynamic range into the video signal then traditional REC709, for increased post-production flexibility. 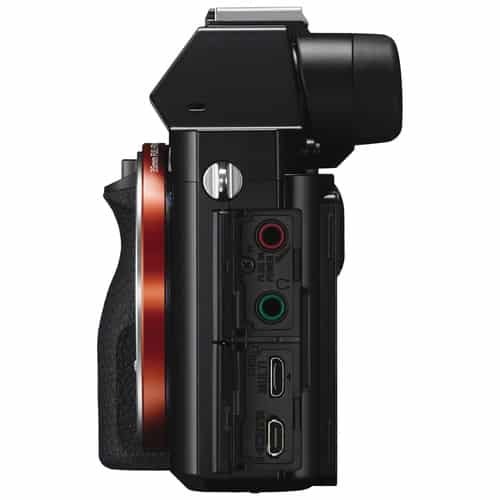 The a7S has multiple timecode recording options to meet different workflows. It has the standard ‘Record Run” mode that only advances the timecode when recording, as well as “Free Run” timecode that advances the timecode even when not recording, which can be great for syncing multiple cameras at live events. It can also record timecode in both drop frame and non-drop frame modes. When recording internally the a7S is also able to output timecode via HDMI. Timecode output is not supported when outputting 4K over HDMI. The a7S features many of the same real-time visual overlays and aids that professional video users have come to rely on. These include focus peaking to aid in manual focusing, zebra markers to help judge overexposure, and an audio level overlay for mixing audio. Also focus magnification is available for checking critical focus. 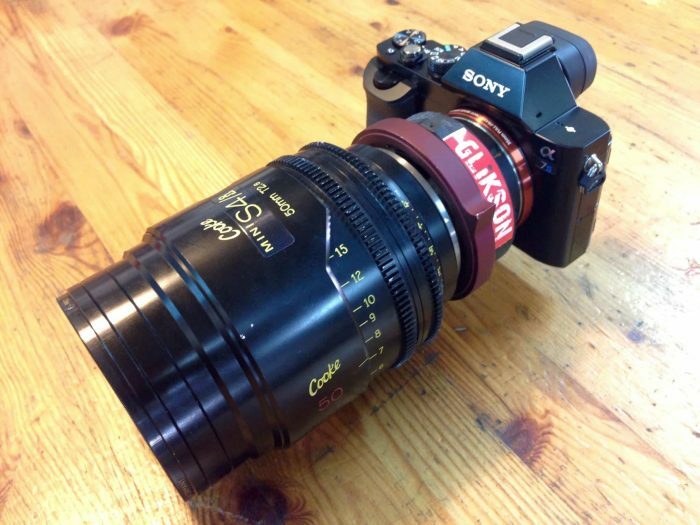 These are available in both viewfinder and LCD display. The a7S features a 3.5mm microphone input jack for compatibility with external microphones. And for users needing more the a7S is also compatible with the Sony XLR-k1M XLR Adapter for recording professional balanced XLR audio signals with phantom power and adjustable mic/line inputs. For monitoring audio the a7S features a 3.5mm headphone jack as well as real time audio levels for a visual reference. 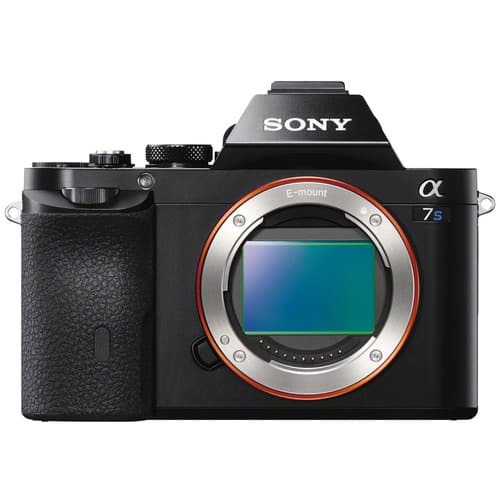 Revolving around a compact, sleek body design, the a7S features both a large rear LCD monitor as well as a bright electronic viewfinder. The rear 3.0″ 921.6k-dot Xtra Fine LCD features a tilting design (up 90° and down 45°) to benefit working from both high and low angles. Also benefitting visibility with the rear monitor is the incorporation of WhiteMagic technology, which noticeably increases brightness for easier viewing in sunlit conditions. When shooting at eye-level, the 0.5″ XGA OLED electronic viewfinder features a high 0.71x magnification and a 2.36 million-dot resolution for precise monitoring capabilities. 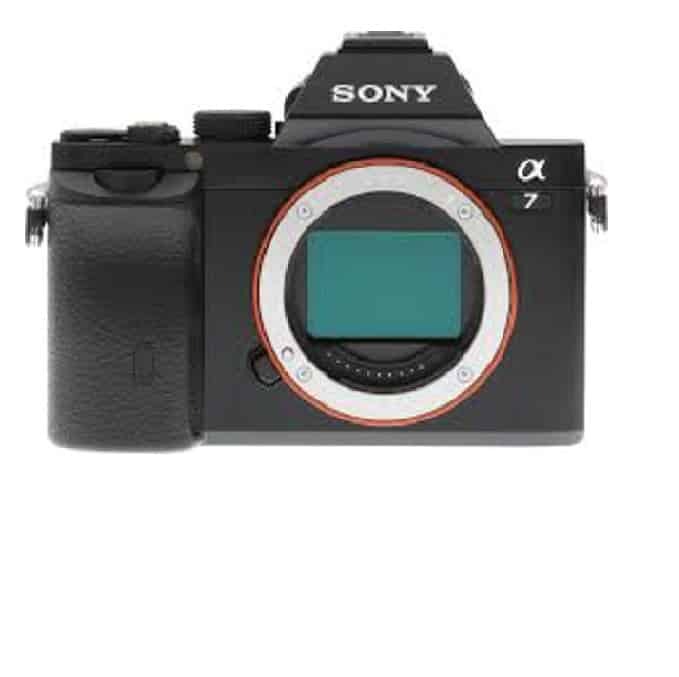 Built-in Wi-Fi connectivity enables the a7S to instantly share imagery to mobile devices for direct sharing online to social networking, via email, and to cloud storage sites. NFC (Near Field Communication) is also supported, which allows for one-touch connection between the camera and compatible mobile devices; no complex set-up is required. Once connected, the linked mobile device can also display a live view image on its screen and remotely control the camera’s shutter.Additionally, PlayMemories Camera Apps are also supported via the built-in Wi-Fi connection, and allow you to personalize the camera’s features depending on specific shooting styles. 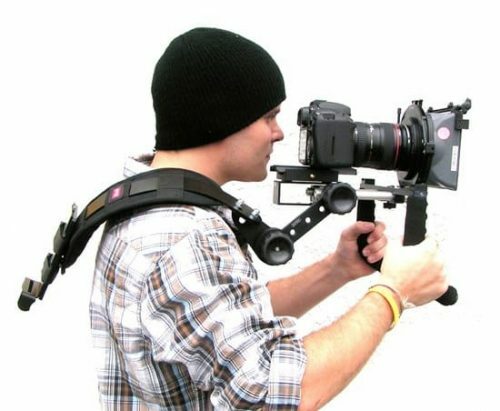 Apps are available to suit creating portraits, detailed close-ups, sports, time lapse, motion shot, and other specific types of imagery. Create Style settings: Standard, Vivid, Neutral, Clear, Deep, Light, Portrait, Landscape, Sunset, Night Scene, Autumn Leaves, Black & White, and Sepia (all with +/- 3 step contrast, saturation, and sharpness adjustment). [800%], S-Log2), Black Gamma, Knee, Color Mode, Color Level, Color Phase, Color Depth, Detail, Copy, and Reset. Face Detection is available to base exposure and focus on up to eight recognized faces. Furthermore, Eye AF can be used for even greater precision by maintaining critical focus on a subject’s eye. Auto Object Framing automatically creates compositions revolving around portrait and still life subjects and aesthetically crops imagery based on the rule of thirds, where the subject is located within the frame, exposure on your subject, and, in the case of portraiture, the direction he or she is looking. 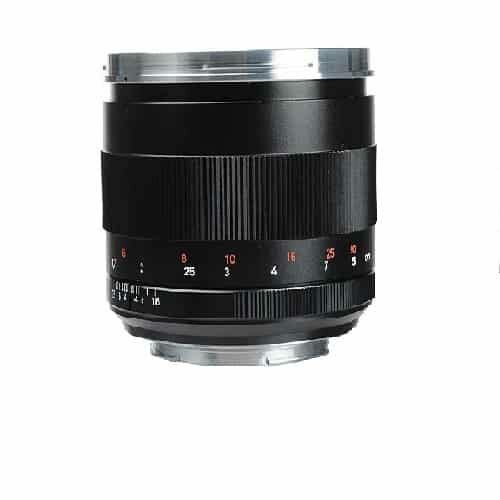 Playback modes: Single (with or without shooting information, Y RGB histogram & highlight/shadow warning), 9/25-frame index view, Enlarged display mode (Maximum magnification L: 13.3x, M: 8.7x, S: 6.7x), Auto Review (10/5/2 sec., off), Image orientation (Auto/Manual/Off selectable), Slideshow, Panorama scrolling, Folder selection (Still/Date/MP4/AVCHD/XAVC S), Forward/Rewind (Movie), Delete, and Protect.